Your CRM solution can help raise customer relationship to the next level with tools for active listening and guidance through the whole customer journey. And for that to happen, you need to harness and nurture the most vital ingredient, leads. "Revenue grows on leads, fished from engagement and mined from profile information." Store your marketing collateral in a centralized document management system so that every team member can have access it when needed. Again, with the help of email templates in your CRM platform, send (actionable) mailers. The scope is much larger (and better) than direct mail. Despite the pervasive reach of social media, voice conversations still holds sway. Why? Because it brings a human touch. Brian Carrol from B2B lead generation has an excellent cold/warm call schedule. Learn more about lead management by CRMNEXT. Build a great first impression. Research about your prospect, find out what's troubling them/the industry and then talk about how your brand can help. Follow up with collateral which are informational/educational. Avoid sales jargons (remember,patience). People will lap up anything labelled FREE. Entice them with FREE trials with full features (recommended). Fast track them with acquisition campaigns taken over from free trials. This should include Call to Action(s). Even after they have signed up as customers, re-engage them with great after sale service, regular feedback surveys, sending new product releases. Revenue grows on leads, fished from engagement and mined from profile information. 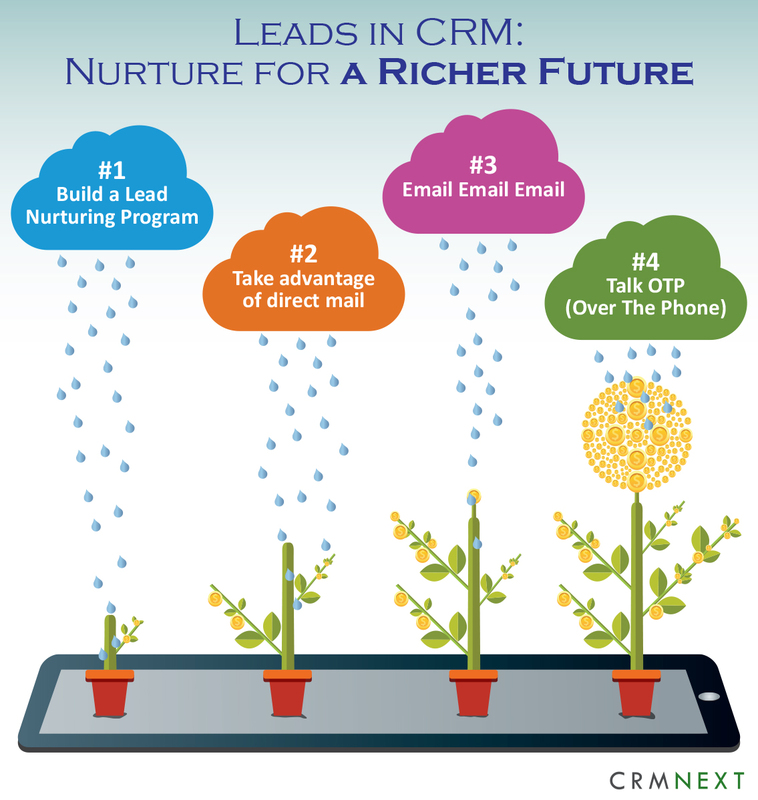 Keep this in mind while nurturing your leads with a cloud CRM solution.